Carbohydrates (also called sugars) are molecules composed of carbon, oxygen and hydrogen. They are converted into glucose, which is an important source of energy for the body that can be quickly started. – galactose; is in milk. – maltose (it is made up of two glucose molecules), it is the basic sugar present in beer, it is also contained in corn. – starch; one starch molecule contains hundreds of glucose molecules. We can find it in cereals (wheat, maize, rice), tubers (potatoes), roots (swede), grains or legumes (beans, lentils, peas, peas, broad beans, soybeans, quinoa). For a long time we have divided sugars into two different groups because we thought that their absorption by the body is not the same. We distinguished between easily digestible sugars and slowly digestible sugars. Under the slogan ‘easily absorbed sugars’ were simple and two-molecular sugars, such as glucose and sucrose, which are found in refined sugars (sugar cane or sugar beets), honey and fruit. The term “fast-absorbed sugars” was based on the belief that due to the simple structure of carbohydrate molecules, their absorption by the body occurs very quickly, shortly after eating food. On the other hand, under the category of “slowly absorbable sugars” we understood all carbohydrates whose complex molecule had to be chemically converted into simple sugars (glucose) during the digestion process. This is the case for products containing starch, because its transformation into glucose is, as was believed, slowly and gradually. This division is obsolete today because it is based on incorrect assumptions. Recent experiments prove that the complexity of the carbohydrate molecule does not determine the rate at which glucose is released and absorbed by the body. It has now been found that the maximum sugar content in blood after consumption of each type of carbohydrates (ie their maximum bioavailability), taken by the body separately and on an empty stomach, is achieved at the same time (about half an hour after ingestion). So instead of talking about the speed of assimilation, you should rather focus on examining carbohydrates for their increased sugar content in the blood. In other words, it’s about the reaction of our body and not the reaction in the test tube. The classification of carbohydrates should take place depending on their ability to increase the blood sugar level, which determines the so-called glycemic index (IG). In order to simplify the case, I suggest to divide carbohydrates into two categories, “good low carbohydrate carbohydrates” and “high carbohydrate carbohydrates”. Distinguishing one from the other will reveal the reasons for a too-large carcass. They are compounds whose absorption causes a strong increase in the level of glucose in the blood (overheating). This includes, among others, plain sugar in all forms (pure or combined with other products, such as confectionery), as well as any commercially processed carbohydrates such as white flour, white (purified) rice, alcohol (with vodka on head), potatoes and corn. These include those whose absorption by the body is poor. As a result, they cause a small increase in the level of glucose in the blood (blood sugar). It is possible to mention here whole grain cereal products, brown uncooked rice, some products rich in starch (lentils, beans), and vegetables and fruits containing a lot of fiber and little glucose (leek, turnip, lettuce, green beans). vegetables, legumes, fruits and cereals in the raw state. We also find them in products called full ones. Although they do not have any energy value a priori, they play an extremely important role in digestive processes, because they reduce the absorption of carbohydrates, thus lowering the blood sugar level. Insoluble fiber (cellulose, hemicellulose) enables normal intestinal patency, and its absence (or even insufficiency) is the cause of most problems associated with constipation. Soluble fiber (gum, pectin) limits the absorption of fats in the digestive process, thus reducing the risk of atherosclerosis. Fiber-rich products are also rich in vitamins, micronutrients and mineral salts, and fiber deficiency can have serious consequences. Over the past few decades, an increase in living standards in highly developed countries has resulted in a decrease in fiber intake. and meat, and the pasta is produced from white flour, purified, that is, from which the fiber was removed. According to medical authorities, this situation is responsible not only for the increase in obesity, but also and above all for the alarming spread of digestive tract cancers. It has been shown that fiber has an indirect beneficial effect on the fight against obesity. Including it in the diet results in lowering the blood sugar content as well as in the level of insulin, ie its level in the blood. Insulin, on the other hand, is a factor that stores excess fats. Fiber is a non-energy substance contained in foods with a low GI of green vegetables (lettuce, endive, leek, spinach, green beans, etc.). Some dry vegetables, fruit and cereal in the raw state also contain a large amount of fiber. The diet should be rich in fiber due to the function it performs in the digestive process, as well as due to the fact that it is helpful in getting rid of overweight. The daily diet of indigenous Africans contains 55 grams of fiber (for comparison, the average European citizen eats only 22 grams of fiber per day), and the percentage of intestinal diseases such as appendicitis, intestinal mucosa and finally colorectal cancer is the lowest there. The ideal amount of fiber intake is at least 35 grams per day. This amount is easily delivered to the body by daily consumption of cereal products, vegetables, fruits, nuts, lentils and beans. and contained in fruits and vegetables helps slow the absorption of sugar into the blood and maintain its constant level. In turn, fiber present in cereal products, such as cereals, is involved in the process of food decomposition and is of particular importance in the prevention of constipation affecting many people. It should be remembered that diets consisting only of purified products, eg meat, eggs, fish and dairy products, do not provide adequate amounts of fiber. Not all carbohydrates can be digested and broken down into glucose. It belongs to non-digestible carbohydrates. It is a natural component of a diet rich in fruits, vegetables, lentils and beans and whole grains. Consuming foods containing large amounts of fiber protects against constipation, reduces the risk of colon cancer, diabetes and diverticulitis. Fiber, although widely regarded as indigestible, participates in digestion, absorbing water, thus increasing the volume of faecal matter, they become less frequent and easier to pass through the intestinal lumen. It shortens the time of residual food in the body and reduces the risk of infection and the development of changes in cells due to the action of carcinogens that arise during the decomposition of certain foods, especially meats. In a person who often eats meat, and little fiber, the passage of food through the digestive tract increases from 24 to 72 hours, which increases the risk of rotting. Therefore, if you like meat, you should also ensure a diet rich in fiber. There are many different types of fiber. Some are proteins, not carbohydrates. they combine with sugar molecules as a result of slowing the absorption of carbohydrates, thus helping to maintain a constant level of sugar in the blood. The types of fiber differ in their ability to absorb water. For example, the fiber contained in wheat increases the volume in water tenfold, while fiber glucomannan, derived from the Japanese plant, the wonder Riviera (Amorphophallus rivieri), swells hundredfold. Fiber with high water absorption capacity, thanks to the properties of increasing the volume of food and the slow release of sugar, helps control appetite and plays an important role in maintaining proper body weight. 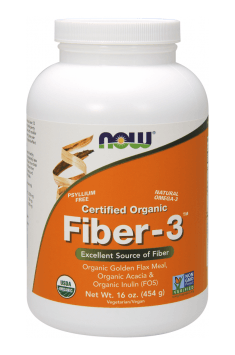 The ideal fiber supply is no less than 35 grams per day. If you eat the right foods, you can achieve this level without additional servings of fiber. It is best to provide fiber from various sources such as oats, lentils, beans, grains, fruits, raw or semi-raw vegetables. In the latter, much of the fiber is destroyed by cooking, so it would be best to eat raw vegetables. Some dietary fibers, consumed in the raw state, form a thick hydrophilic gel depositing on the walls of the gastrointestinal tract. It delays the emptying of the intestines, creating a kind of filter limiting the absorption of glucose. As a result, the human body receives less energy, while avoiding a sharp increase in blood sugar, which occurs after a meal. This phenomenon mainly concerns pectins and gums. One of the biggest problems faced by obese people is hyperinsulinism and resistance to insulin. The cause of these disorders is a rapid increase in blood glucose (a glycemic peak) due to the intake of certain carbohydrates. Pectin and gum prevent this phenomenon. A rich source of pectin is fruits (mainly apples) and dried legume seeds. One apple contains about 12 grams of carbohydrates and 2.5 grams of fiber (pectin and cellulose). The most commonly used gum in the food industry is guar, obtained from legumes growing in India. Some vegetables and oats also contain gums. Guar improves insulin sensitivity, reducing resistance to this compound. By lowering the glycemic peak, it reduces the activation of B cells in the pancreas. Insulin secretion is partially induced and regulated by the hormonal system (gastric GIP inhibitory peptide) and enteroglucagon. An increase in fiber intake leads to a decrease in the GIP response and enteroglucagon. What’s more, food fibers are responsible for eliminating reactive hypoglycaemia, either because of a decrease in the level of insulin secretion or due to the stimulation of glucagon secretion from the pancreas three hours after food intake. Also in the case of diabetes, increased fiber intake has beneficial effects. In his research, Miranda showed that 20g of fiber can reduce the excess of blood sugar in a person with diabetes from 57 to 13%. The administration of fiber also has a beneficial effect on the level of cholesterol in the blood. The soluble dietary fiber binds bile acids and hinders formation of micelles in the proximal ileum. As a result of this process, the amount of cholesterol and fatty acids absorbed is reduced and / or the size of the lipoprotein molecules synthesized by the intestinal mucosa is modified. Soluble dietary fibers increase the excretion of bile acids in the faeces and block the synthesis of lipoproteins occurring in the liver. The soluble dietary fibers undergo extensive bacterial fermentation in the large intestine. As a result of these processes, gases and short-chain fatty acids are formed that penetrate into the portal vessels and modify cholesterol biosynthesis in the liver.